Monrovia, Liberia—The sirens usually sound on Monrovia’s Tubman Boulevard in the early evening. In the Sinkor district of the Liberian capital SUVs belonging to NGOs, motorbikes, and local jalopies pull over to either side of the road to make way for the absurdly over-sized motorcade that follows. There are men with guns in pickups, cars and four-wheel drive vehicles, perhaps an ambulance, and U.N. personnel in bulky Nissan Patrols. In one of the poorest countries in the world the display strikes one as tasteless and needlessly provocative, yet it belongs to a woman the world has just venerated with the Nobel Peace Prize: Liberian President Ellen Johnson Sirleaf. It is an instructive scene, however. Sirleaf is, in fact, far less popular at home than she is in the international community. The Nobel is just the latest sign of the deep disjunction between her reputation at home and abroad. JOHNSON’S INTERNATIONAL STAR has been in ascendance for some time now, and not without reason: She is a deeply impressive woman. She studied at Harvard and worked in Liberia’s ministry of finance in the 1970s, first as deputy minister and later as minister. She worked for the World Bank in Washington and also for Citibank and the United Nations Development Programme. After an unsuccessful run in 1997, she was elected president of Liberia in 2005, two years after the end of 14 years of intermittent, and profoundly horrible, civil war—becoming Africa’s first female head of state. Since coming to power, the former World Bank official has negotiated debt relief for Liberia, overseen improvements to human rights and freedom of speech, and attracted substantial investments by foreign firms. 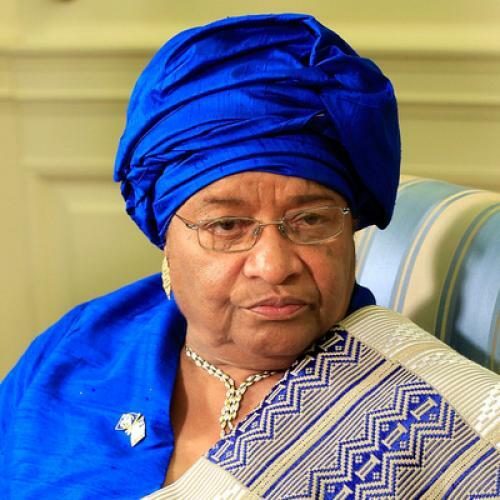 Under her tenure, Liberia’s economy has grown dramatically. I have interviewed two serving and three former heads of state from Sierra Leone and Liberia; of those five politicians she was the only woman and undoubtedly the most commanding. For all of this, Sirleaf has received considerable acclaim. In 2010, she was featured on Newsweek’s list of top ten global leaders. She has spoken at Harvard as well as to Jon Stewart. George Bush awarded her the Presidential Medal of Freedom in 2007, and she has picked up a sheaf of honorary degrees from western universities. There are other issues that mar Sirleaf’s domestic record as well. In 2005, two years after the end of its civil war, Liberia convened a Truth and Reconciliation Commission (TRC), following the precedent of the post-apartheid South African body chaired by Archbishop Desmond Tutu. Such bodies are now becoming a standard part of the post-conflict African toolkit, another Band-Aid for ailing states when the worst seems to be over. The report prepared by the Liberian TRC included a list of individuals who should be banned from involvement in Liberian politics for 30 years. Ellen Johnson Sirleaf was on that list, due to her onetime support for the warlord and former Liberian President Charles Taylor, now on trial for war crimes committed in neighboring Sierra Leone in the Hague. Sirleaf has admitted that she flirted with Taylor—who entered Liberia from Cote D’Ivoire in 1989—as a possible alternative to the disastrous rule of Samuel Doe, who had taken power in a bloody coup in 1980. She points out that others in the Liberian diaspora did the same and says she rapidly broke with Taylor when she perceived his true colors. Sirleaf though ignored the TRC’s recommendation that she remove herself from politics. In some ways that is understandable—an argument can be made that Liberia needs her in government rather than out of it. However, the wider result is that the entire report has effectively been shelved. Alongside the list of those who should be banned from politics, the TRC also recommended a smaller number of individuals for prosecution. As a result of Sirleaf’s failure to implement the report, those prosecutions are not going ahead, and that has cost Sirleaf political capital and credibility. She also broke an earlier promise to only stand for one term, saying that she did not realize the scale of the task at hand when she first took office and that she needs more time to complete her agenda. “Monkey still working, let baboon wait small,” reads one of her campaign posters. Another uses the metaphor of an airplane, suggesting that it is premature to change the pilots before landing. Whether these claims will placate the public is less clear. There was an expectation, at the start of her term, that things would rapidly improve. Perhaps unfairly, many former fighters, denied education by 14 years of civil strife, feel that she has not been able to effect change quickly enough. “Mama Ellen” as she is known in her country is still the front-runner in Tuesday’s presidential election. The most serious opposition comes from the Congress for Democratic Change Party and its candidate, Winston Tubman, who is a former U.N. envoy to Somalia and, like Sirleaf, Harvard educated. Tubman’s running mate is George Weah, the former FIFA world footballer of the year. Weah, who ran unsuccessfully in 2005, is hugely popular among youth, though there are questions about his credentials for governing.Another contender is Prince Yormie Johnson, whose extensive war crimes I have previously surveyed. Considering this mixed field, and Sirleaf’s technocratic skills, record of reform, and international connections, she is indeed probably the best option for her country. But, this is something that the Liberian people should decide for themselves, without splashy foreign celebration muddying the political waters and minimizing her limitations as a leader. The Nobel Prize Committee, of course, has its own schedule to keep, but awarding Sirleaf perhaps the most celebrated diplomatic prize in the world only four days before Liberia’s presidential election was insensitive to the complexities of this nascent democracy—a democracy that is barely clinging to evidence of its legitimacy. To her credit, Sirleaf has apparently been downplaying—if not ignoring—the Nobel on the campaign trail. She seems to understand, as the Nobel committee apparently did not, that it is the Liberian people whose votes should count the most. Simon Akam is Reuters’ correspondent in Sierre Leone. His website is www.simonakam.com.